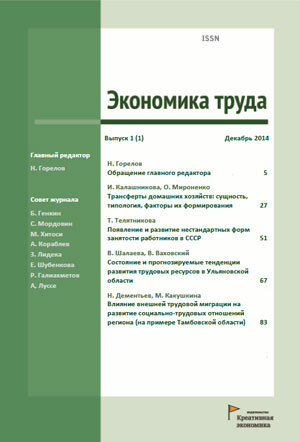 The Russian Journal of Entrepreneurship is devoted to studies in the field of economic, social, demographic, and legal aspects of entrepreneurship. The journal covers the issues of the entrepreneurial activities organization, management, marketing, state regulation, intercompany and public-private interaction, and particular field-specific and regional features of entrepreneurial units. The Editorial Board places a special priority on the studies in the field of developing and incenting entrepreneurial activities. The main content of the journal includes analytical reviews and the results of original scientific studies. Please, submit your paper via rp@creativeconomy.ru. Vartanova M.L., Gazimagomedova P.K., Salavatova N.A. Ruyga I.R., Yamschikov A.S., Teterin Yu.A., Chayka A.A.
Petrova A.D., Blazhenkova N.M., Aznabaeva G.Kh., Zaripova I.R., Zyryanova M.P., Kalimullina E.R., Orlova N.V., Samarina E.A., Iraeva N.G., Ismagilova T.V. Grinko E.L., Cheremisinova D.V., Tarasenko S.V. Vasileva Z.A., Moskvina A.V., Bagdasaryan N.A. Ismagilov R.Kh., Sergeev Yu.A., Gumerov A.V. Pavlov A.Yu., Kudasheva M.S., Karmyshova Yu.V. Yakhneeva I.V., Khansevyarov R.I., Zhabin A.P., Volkodavova E.V. Gambeeva Yu.N., Medvedeva S.N., Balashov E.L.
Chernenko E.M., Lebedeva I.S., Lebedev P.V. Vasileva Z.A., Likhacheva T.P., Filimonenko I.V., Moskvina A.V., Borodkina V.V. Zhernov E.E., Nekhoda E.V., Redchikova N.A. Panasenko S.V., Mazunina T.A., Voronina E.V. Zvereva A.O., Ivanov G.G., Perelman M.A. Slepenkova E.V., Murtuzalieva T.V., Seyfullaeva M.E. Bragin L.A., Pankina T.V., Nikishin A.F. Mityaeva O.A., Shvetsov S.A., Ilyashenko S.B. Barmina E.E., Pisareva E.V., Galkina L.S. Ramazanov I.A., Kalugina S.A., Mayorova E.A. Drobot E.V., Makarov I.N., Kolesnikov V.V. Khairov B.G., Khairova S.M., Kovalev V.A. Burlachkov V. K., Pausheva T.E. Ruyga I.R., Likhachev M.A., Bagdasaryan N.A., Bagdasaryan L.A., Kovzunova E.S. Mayzel S.G., Sharapova V.M., Kot E.M., Smirnova E.D., Kazimirovskikh A.I. Usov N.V., Trofimov O.V., Frolov V.G., Makusheva Yu.A., Kovylkin D.Yu. Vasileva Z.A., Likhacheva T.P., Ruyga I.R., Filimonenko I.V. Zharikov A.V., Shiryaeva Yu.S., Ilicheva N.M.
Mylnikova E.M., Nagibina N.P., Yakupova O.V. Vashko T.A., Zdrestova-Zakharenkova S.V., Maksimenko I.A. Arkhipov A.E., Sevryukov I.Yu., Pechenevskaya A.A.
Karginova-Gubinova V.V., Romashkina Yu.V., Prokopev E.A. Emelyanov A.A., Pelymskaya I.S., Voronov D.S., Berezyuk M.V. Vlazneva S.A., Mishina N.A., Krapchina L.N., Kotova L.G.